It's about two months to the end of 2016 and i'm gonna put it out there and declare Fat Lulu’s Asian Barbecue & Dessert as my favorite brunch spot of the year. 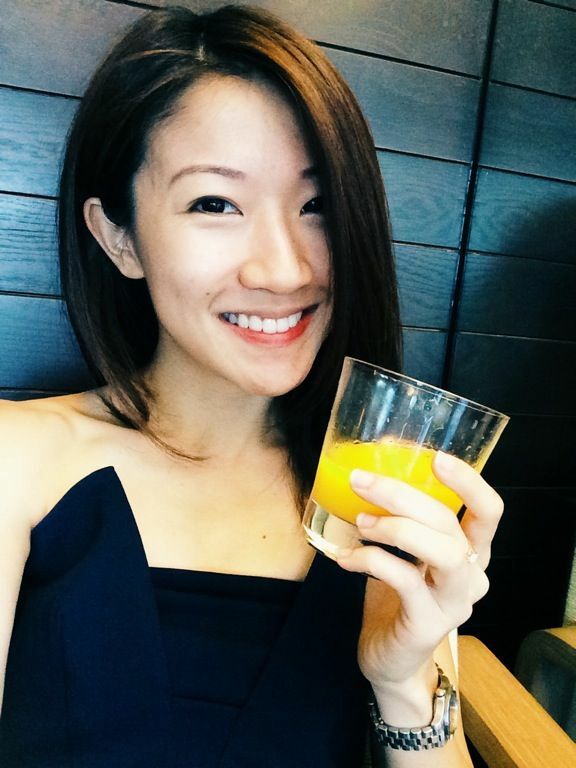 This wild child is given birth by the dynamic duo Sam and Song (who founded and rebranded Five & Dime in the same River Valley Road spot) and boy is it a 360 deg change that is certainly a breath of fresh air in the F&B scene. Wicked BBQ. Smooth Desserts. They are as distinct as day and night but they complement each other perfectly. Chef Sam helms the #NoBurnNoTaste charcoal BBQ, blasting kickass flavors into meats, fish, and vegetables seasoned with Asian spices and chillis. 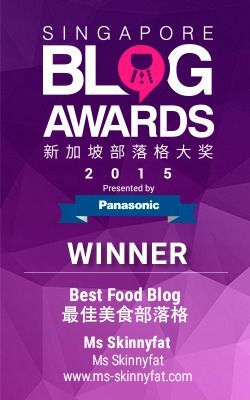 On the other hand, Chef Song presents desserts of refined delicacy that are technique-driven and visually arresting. 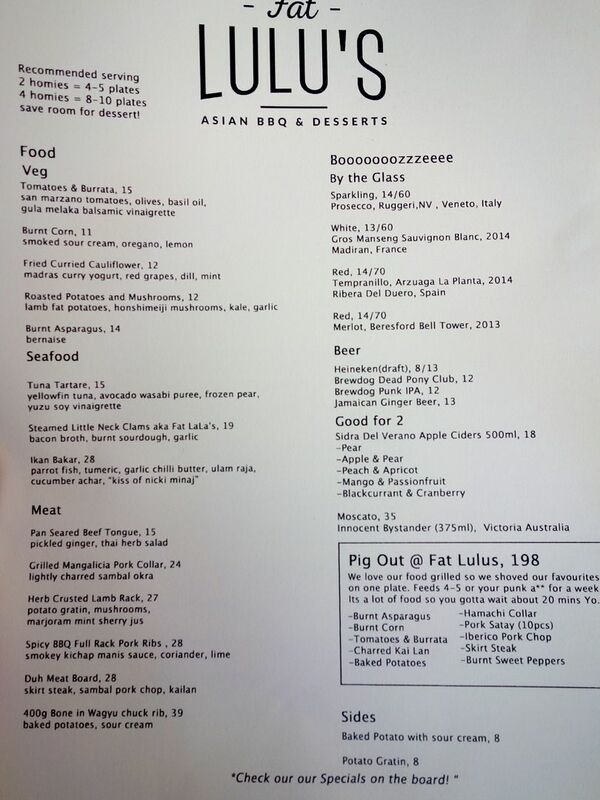 Here is practically all the brunch items that you can feast on at Fat Lulu's (we only missed 2). For a punchy kickass breakfast, go with the Croque Tambi ($18). 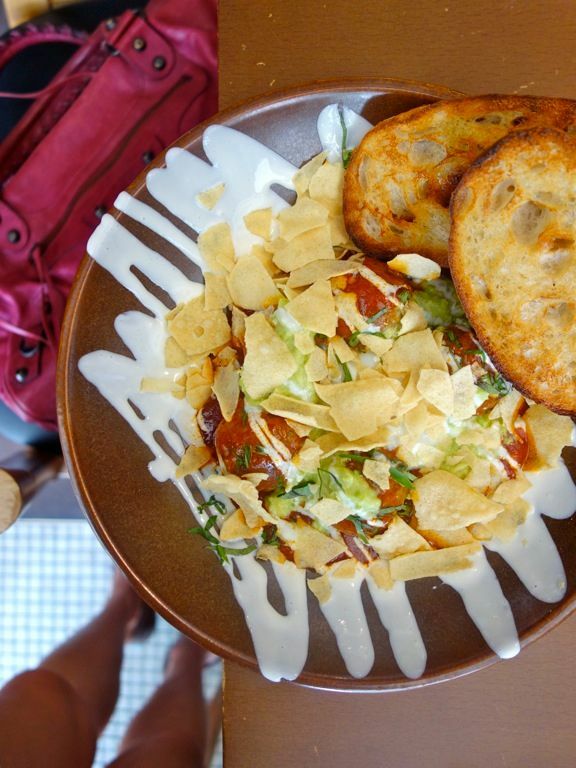 There’s a murtabak-styled omelette, doused in sriracha, Japanese Kewpie mayonnaise and slices of pan-seared meaty Scarmoza cheese, all sandwiched between homemade burnt-on-the-grill ciabatta bread. It’s a delicious mess you wanna get into. Cool off from the heat with the side of raita (an Indian style salad) made with cucumber, pineapple, and coriander. Every bite of the Fried chicken with pancakes ($22) was a party in our mouths! 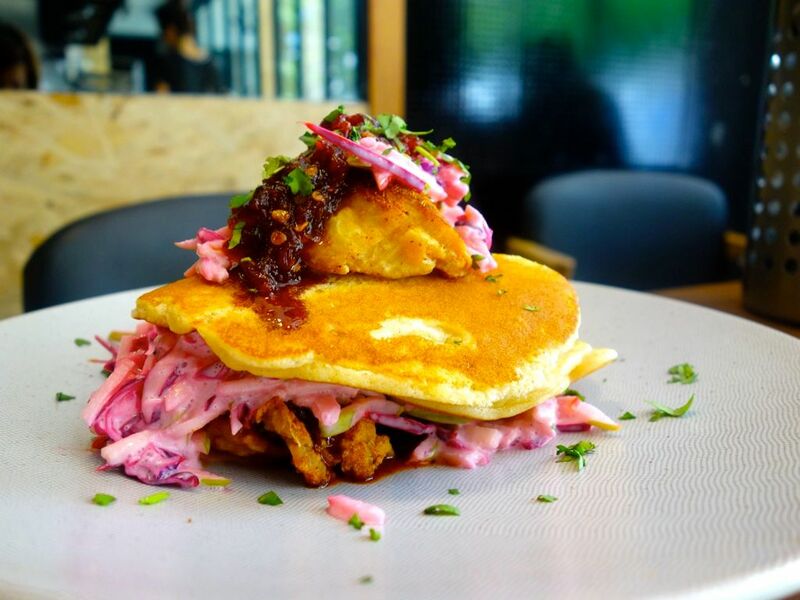 There's the spicy pseudo-thai style gula melaka chili sauce; tangy slaw of red cabbage with apples in Kewpie mayo; succulent fried chicken that has been brine overnight; sweetened by some light fluffy pancakes. 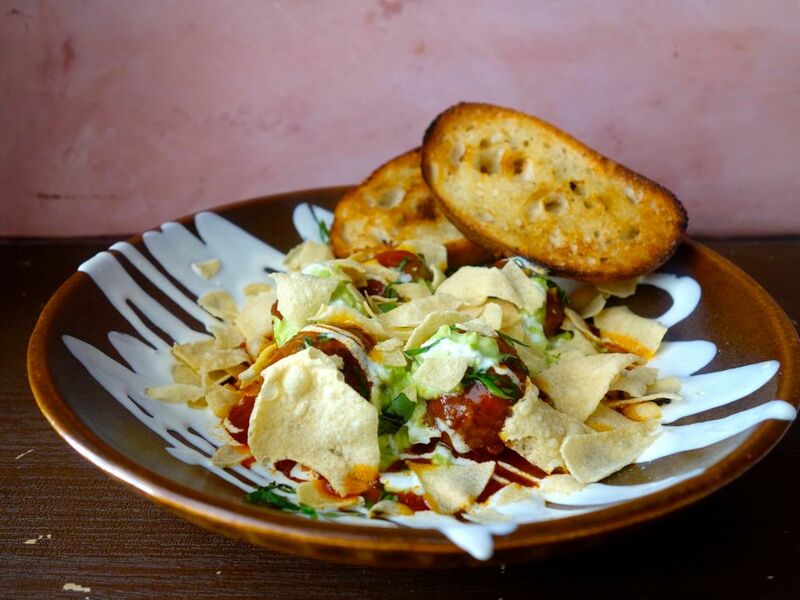 Another winner is the hearty and comforting Lamb Meatballs ($23) with tomato sauce, fava beans, soft eggs and papadum. The spiced up meat balls (flavored with cumin, fennel, cardamon, and onions) are cooked in a tomato sauce that reminded us of chili crab sauce. We were happy to mop all the sauce with the crunchy toast. Feel that the dishes are too heavy for brunch? Well to play it safe (but certainly not boring), there's the delicious Bacon and Eggs ($22). 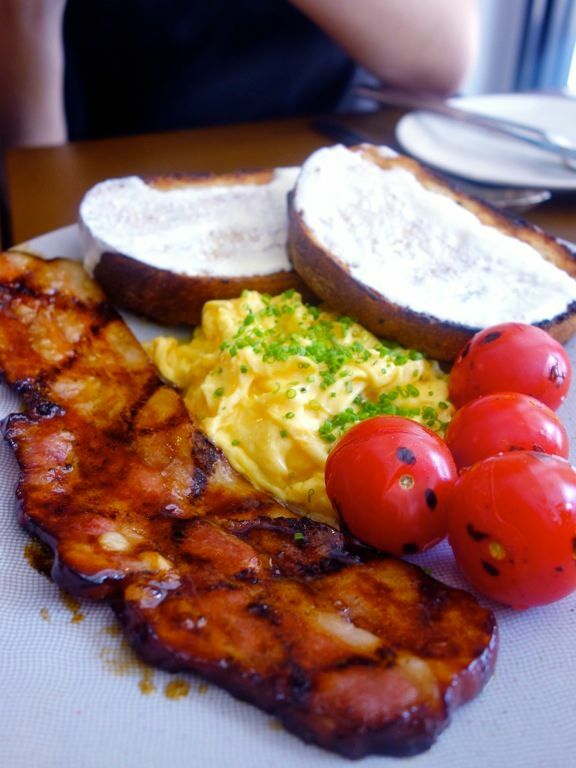 Boy do we love that smoky thick cut slab bacon with with a blooming flower of creamy scrambled eggs. Layer them on top of the crunchy garlic-sour cream toast and you'd be sent to breakfast heaven with one bite. 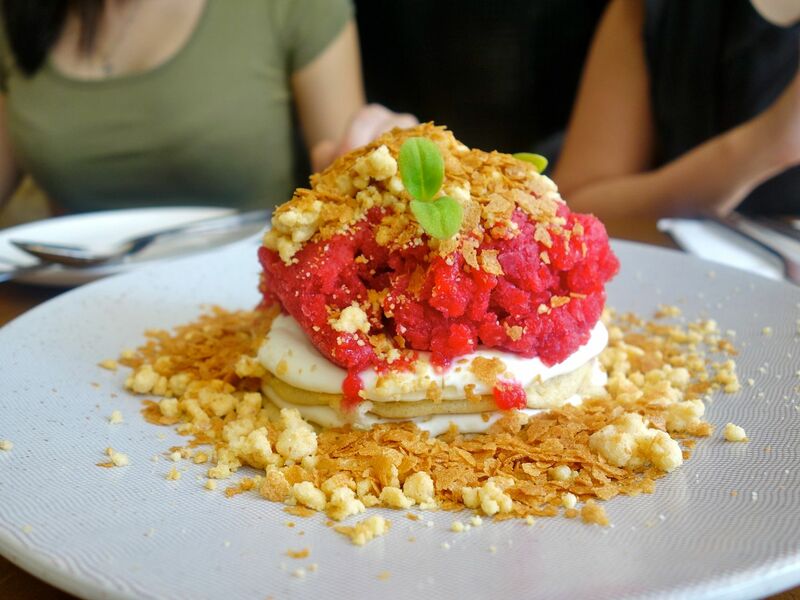 If you're more the sweet mornings kind of person, then check out the Pancakes and friends ($16) with cream cheese chantilly, raspberry and coconut crumbs. I'm definitely a friend of this one! I wouldn't have thought of having a tart granita on my pancakes but it provided a refreshing tang to the batter. The clever use of the cream cheese chantilly also provided a creamy texture without the heaviness. Oh and that crunchy coconut crumbs and digestive biscuit crumbs that i couldn't stop munching on. I wouldn't pick a rice pudding for brunch but the small but filling Vanilla & Pandan Sticky Rice ($12) changed my mind. 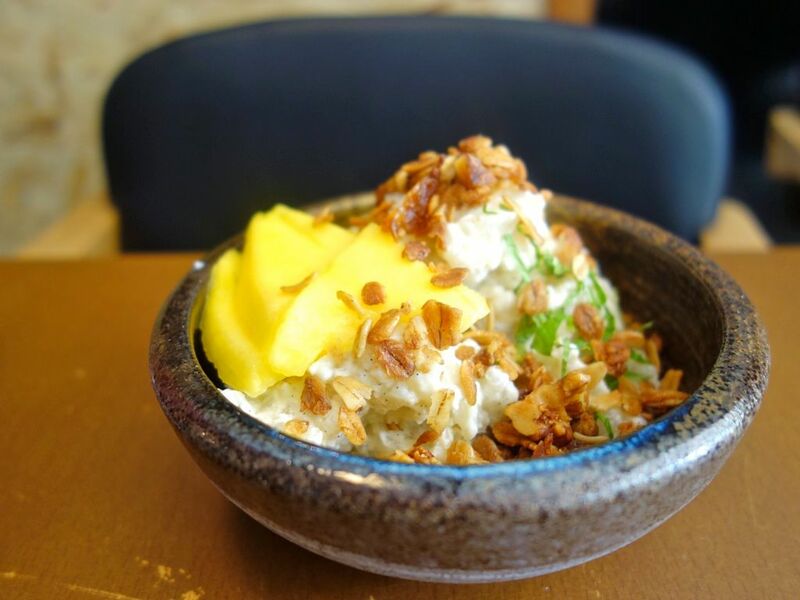 Chef Song's fragrant coconut arrborio rice pudding cooked with pandan and vanilla is his ideal of comfort food and it jolly well be ours too! 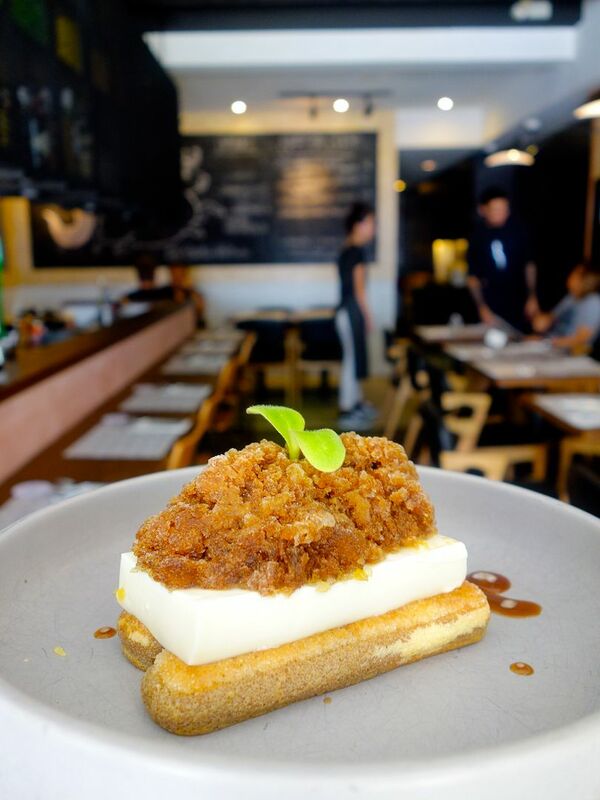 The sticky sweet coconut dessert is topped with a crunchy homemade granola and a silky coconut yogurt. There's also a subtle touch of cinnamon and cardamom to give it an added homey flavor. Who says we can't have sweets for breakfast! 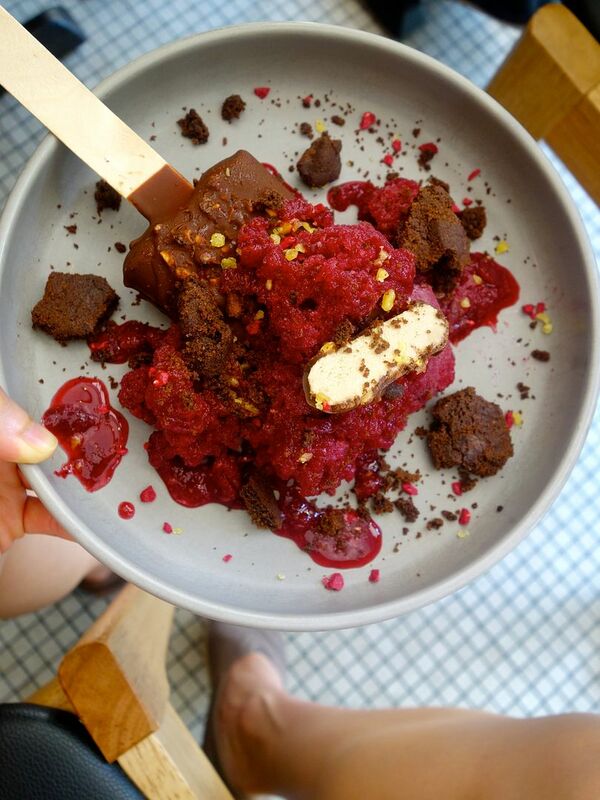 If you can't live without proper desserts, you have to try the creative ones at Fat Lulu's! The Usinarit (or tiramisu spelt backwards) ($14) features a mascarpone panna cotta with kahlua granita. Super light and interesting take of the traditional Italian sweet, with a popping surprise in the mix. We all turned five again when we dug into Childhood ($16), a giant peanut butter-hazelnut popsicle, sprinkled with chocolate cookie and cassis granita. SO DAYUM UNCOMPLICATED AND GOOD. 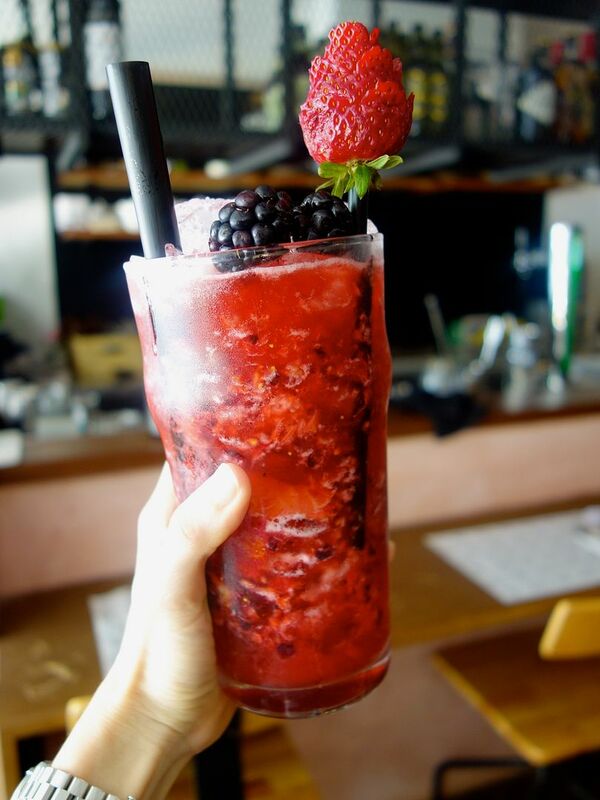 The refreshing teas also make for perfect start and ending to the meal. The Berry berries tea ($12) is a thirst quenching English breakfast tea mixed with fresh fruits, full of antioxidants too. 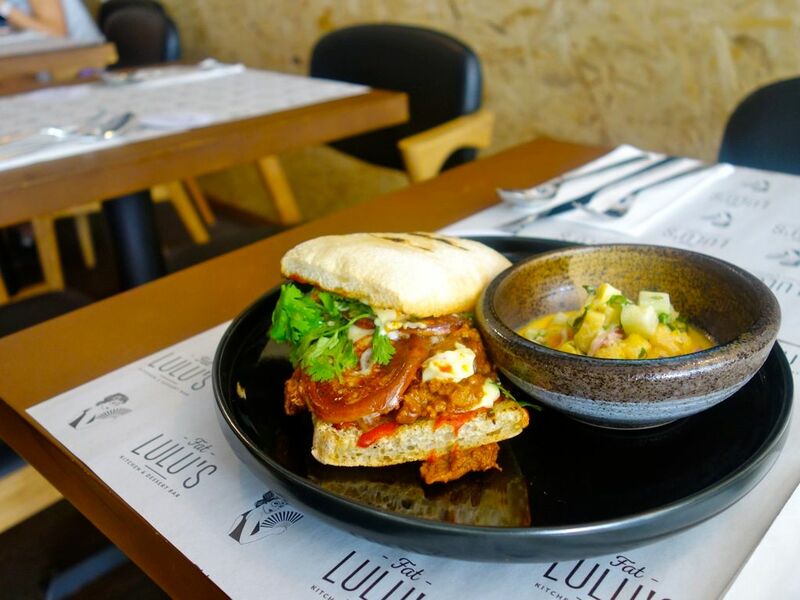 We really love Fat Lulu's and their creative brunch dishes. Honestly the cafe-brunch fatigue is real and this gives us hope really! 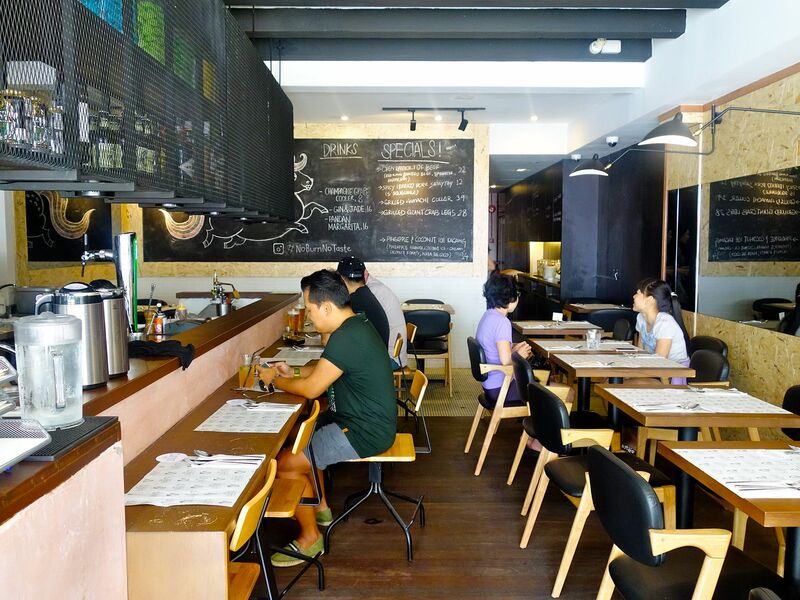 Plus plus plus, go from day to night with their aahhhmazing BBQ dinner. More reasons to be back!